If you have ever been to a Kundalini Yoga class you might’ve noticed that there are two things that are big in this style of yoga. You might even say there’s an obsession with the Navel Point and Root Lock. “In the Ancient Shastras it states that “all yoga starts at the navel point”. The navel point is important in a few different spiritual practises from martial arts, Tai Chi and Qi Gong where the navel is referred to as the Dantien to Kundalini yoga. You may not consider martial arts spiritual however, when I was taking fuijan shoalin it definitely carried that side with the meditative side of the postures and qi gong classes. Your navel point in Kundalini Yoga is located approximately two inches below your belly button. It is said to be directly connected to the Sacral Chakra, aka Manipura. The navel point is said to be the point where 72,000 nerve endings come together. The bird’s egg shaped navel points enclose the starting point of the 72,000 nerve endings that also called Nadi’s. There are 72 vital nadis, and there are 3 important nadis that are essential for Kundalini Yoga. Ida, pingala, and sushmuna. Today I’ll be focused on sushmuna. The sushmuna is the central nadi that lines the spine. It begins in the root, and extends to the top of the head, traveling up the center of the spine. This is the channel kundalini travels up. We can use the navel point to vibrate the 3 essential nadi’s that in turn vibrate all 72,000 nadis. This vibration informs all of your ten bodies, your physical body, your emotional and mental bodies how they should be. It is in the navel that the energies prana and apana meet. Prana is the subtle life force energy that codes and creates motion in the body and mind. Apana is the eliminating force of the body. This is where they come into balance, and when they do, they unite. When this happens the energy they create together, their heat, activates the sushmuna nadi which allows the kundalini to rise. We balance the prana and apana energies with the use of breath (hence why ida and pingala nadi’s are so important) and with mental direction, aka visualization. We “power” the rising of the kundalini by using the pressure created by the union of the prana and apana energies. We stimulate the rising of the kundalini energies with more visualization and by applying the root lock pushing the energy up, then applying a diaphragm lock and then the neck lock pushing the kundalini up through the crown. In kundalini yoga it is stated that there are various maladies that are caused by the navel point being out of place. The maladies can include improper digestion, constipation, bad dreams, acute pain, heart trouble and more. Testing the navel point is super easy. You want to make sure that you are an empty or almost empty stomach before doing this. Lie on your back, relaxing. 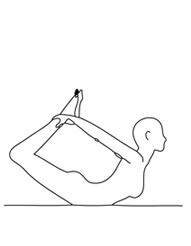 Do Stretch Pose for 2-3 minutes as best you can. Relax down, and make your fingers into the picture, the tips are in a circle. Press your finger tips gently down on your belly button and find where the pulse is the strongest. Your navel point can be reset by doing Stretch Pose or Bow Pose or both for a few minutes each every day. The navel point is heavily associated with this part of the chakra system, though this chakra tends to be known for its location at the solar plexus. According to my textbook, the navel point is fed by the fire of the solar plexus. This means that the stronger and more in balance our third chakra is the more our navel point is fed, stabilized, and in order. The navel center is the beginning. It is the first point we are nurtured and given and energy, and once the umbilical cord is severed, it continues to gather energy from the cosmos. As we move around the hairs on the body gradually accumulate energy and send it to the navel. The solar plexus is noted for the place holding our personal power and will. This is the center of the spiritual warrior because this is the chakra that gifts us with the ability to initiate one’s mission and complete it. This chakra is about action, being in integrity, and taking risks. Focus and the ability to use our feelings to fuel action come from this chakra. Speaking from the navel point lends an air of authority as its base language is “command”. When I was leading Aquarian Sadhana for the first time I had experience of this. I had lead the morning in my normal voice, a very soft sweet voice. At the end of the session the feedback I received was to project my voice a bit more. I thanked them for the feedback, and as the musicians were getting ready, I asked if I could state a decree for the Ascended Master of the Day. I explained that I’m studying the Ascended Master Teachings, and the school I’m learning through as a thing called the Seven Sacred Weeks where each day is a different Ascended Master that we can call to bring their blessings to our day. Everyone agreed so I grabbed my decree book, and read the decree out loud. My voice was strong, authoritative, and loud as your voice tends to be when making a decree. Everyone stopped in surprise and listened to the decree respectfully. One of my friends started laughing when I was done and said, “There’s your yoga voice.” Everyone nodded. I was surprised. “Oh, you mean DECREE what you want your class to do?” I thought. Maybe that would be too powerful. But every yoga class I’ve really liked has been when the yoga teacher knows when to project and when to be silent. If you want me meditating let me meditate. Don’t yell at me. Project your voice. When the voice comes from the navel point people can’t help but listen to you. And they don’t question you because you are powerful. That’s how strong and commanding it comes out! In Teacher Training Guru Ram Das states that if we heal the third chakra first, then we can heal the fourth chakra and all other chakras can be healed. The navel point seems to be the key to kundalini yoga and the key to raising the kundalini energy.